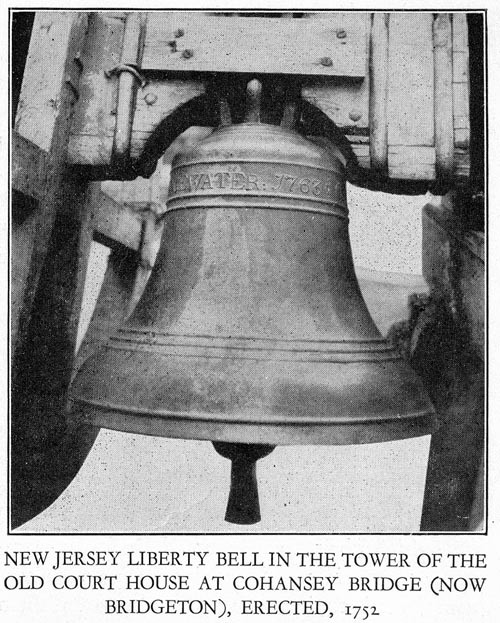 The New Jersey Liberty Bell in the Tower of the Old Court House at Cohansey Bridge (now Bridgeton), Erected, 1751, rang out the news of the Declaration of Independence, July 4, 1776. Transferred to Fireman's Hall when the Court House was razed in 1846. Thereafter used as a fire alarm bell until 1854, when it was placed in the cupola of the West Jersey Academy. Still well preserved and now located on the Bridgeton High School. 1. "History and Government," New Jersey: Life, Industries and Resources of a Great State, 1928, page 19.